Attempting to copy music (m4a) files from laptop to external device (LG G7 phone connected via usb cable) via mass copy-paste of a list of directories. Randomly, copy/paste will stop and error reported. 1) Plug phone into computer. 2) Copy a large number of directories with nested file structures to phone from computer hard drive, via Nautilus: [highlight files on computer, then ctrl-c; go to directory on phone, then ctrl-v]. Expected outcome: No copy errors. mtp://LGE_LG-G710_LGG710PMd4...". Show more details : "File not found". I can't force reproducibility, sometimes it won't complain, but larger copy/paste datasets correlate to more likely ending up with an error. Workarounds: At error, select 'Cancel'; delete the offending subdirectory/file from the phone; restart the copy-paste operation from the point of failure; repeat as necessary. 500 http://us.archive.ubuntu.com/ubuntu cosmic/main amd64 Packages"
I reproduced the bug again this morning, first thing this boot cycle. I am including the journalctl log as requested, as well as a screenshot. Yes, my phone was plugged into the computer via usb cable. The log has that error at 08:06:01, do you remember if that's the time where you saw the problem? The log suggest that the lower level stack kernel/libmtp acted like if the device vanished and got plugged again. Are you confident the cable doesn't have a loose connection? Does copying from the same device/cable works fine from other computer (or ideally from the same computer on another OS)? Yes, that's the proper time code. Yes, I'm also sure that it's not a problem with the physical connection. No. Following the same steps but replacing the phone with a regular USB (EMTEC-brand) 64GB thumb drive, and using the same USB connector, I am able to move the music folders/files over with no errors. When I first connect the phone to the computer, the phone asks me to allow/disallow USB file transfer. Also, the phone charges whenever it is plugged in to an applicable USB port, even during data transfer. The phone never stopped charging during the event; neither did the phone indicate any need to reconnect to the computer nor have me re-authorize data transfer. This indicates the phone never thought it had been disconnected from the power source, at least. If there's a diagnosable problem on the phone's side, I wouldn't know how to debug that. As for the cable, it's new. I have used it only three times, and keep it wrapped up in the original packaging when not in use. I've only used the cable between my phone and the computer in question, though. As indicated before, however, I don't think there's a problem with the cord because the phone never stopped charging during the event. now moving the music files off my computer and onto a flash for some testing on another box later this afternoon. 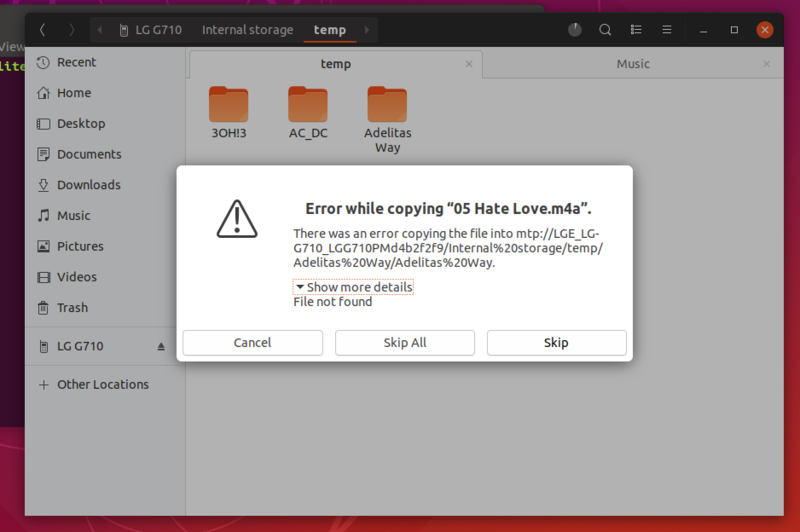 As part of a more thorough test of the connection of my device, I reproduced the error again today, and also installed gmtp (1.3.10-1) on my system to see if I could move files over more easily that way instead. gmtp fails to connect to my device. I'm including another journalctl, testing started about 8:40am. You should find similar errors relating to my reproduction of the file transfer via copy/paste, and there may or may not be errors relating to gmtp failing to connect to my phone. Device 0 (VID=1004 and PID=631c) is a LG Electronics Inc. Various E and P models. Detect: Unable to open raw device? LIBMTP PANIC: Trying to dump the error stack of a NULL device! LIBMTP PANIC: Trying to clear the error stack of a NULL device! <edit last comment> The 'warnings' from gmtp are coming from the command line, not the graphical portion of the application. I looked up libusb error -6. It indicates that the device in question is "BUSY". Should I report this as a bug to libusb/gmtp? The computer wasn't performing any other read/write operations with the phone when I tried to attach gmtp, so far as I am aware. I might have had nautilus open inside of a directory on the phone's storage, to confirm the device was connected, but that's it. Im going to try installing android-udev next time I have my box on. But the guy's post indicates he failed completely, while with my issue, I can at least move files over in chunks. I observed that libmtp contains a large listing of device/vendor information tied in with special flags for handling/mitigating errors. I noticed my device is not in the list. Not sure if libmtp's adding of my device's info and related device flags would make a difference? Please Disregard last comment. It is listed. android-udev-rules https://github.com/M0Rf30/android-udev-rules as installed exactly according to the directions did not fix the issue. Noticeably, however, the file transfer got further than average by a great margin. I'm wondering if it could be related to https://sourceforge.net/p/libmtp/bugs/1797/. Newer Linux kernels require an updated udev rule which is only available with libmtp 1.1.16 (not in cosmic).